I think we are among the last few people who have not visited Kidzania. It’s not a place that is on my list of places to visit for now because Faith is still so young. What could she learn from the experience? Would she enjoy herself? The entrance fee itself is high and I needed to make sure that we will be spending our $$ wisely. Thankfully, our friend had won passes for the adults and all we needed to spend on was the fee for the girl. So, in the end, we found our way to Kidzania (Sg). It was the first Saturday of the year-end school holidays and we were expecting great crowd so I had braced myself for such a turnout. Managing expectations is important. Alas, we were taken by surprise that it was not THAT crowded! It was this empty when we arrived and there was NO queue when we checked in. We were told that there was an event held earlier in the morning and that we should expect the participants to stay on. Okay! The first thing the kids have to do is to open a bank account so that they could deposit their ‘hard-earned’ money into their account. We have not brought the girl to a bank before and she was clueless as to what to do. (-_Q) I actually found myself shouting to guide her from outside. So unglam. Her first job? Post woman! This is a relatively easy task and I think she would enjoy it. All ready for the job yo! It’s good to visit Kidzania with a friend so that both can help and encourage each other. I suppose if Faith was to come alone, she would take a LONG time to warm up and participate. Trust me, they had fun. The next job that she went for was the dentist. It wasn’t her choice, really. We were just looking for the next possible job, one that would not require her to queue for too long. The queue for the dentist was one of the shorter ones because they were ending their previous round and would just need the next round of participants to queue for about 10 minutes which was decent. So, I’ve learnt that one has to learn to play the waiting game at Kidzania. It’s truly training of patience. The next job that Faith was willing to queue up for was a doctor in the A & E department. She must really wanted to learn about this role because she waited in line for about 20 minutes then and the whole session would take about 55 minutes. While she was learning about being a doctor, that was the best time for the adults to take a breather and have a bite at the eateries in Kidzania. Before we could finish our meal, we were alerted that there was an ‘accident’ and had to quickly finish so that we could (ahem) rush to take pictures of our child at work. Faith was just playing the observing doctor throughout and I wasn’t sure what she was thinking about. Was she trying to make sense of the whole thing? This was a scene in which a hotel was on fire. And who came to the rescue? Fire fighters! This was interesting but unfortunately, the girl didn’t manage to be one. This was at Acting School. We asked Faith to go in since her friend was interested in this and also, it didn’t require us to wait. But, halfway through, she asked to come out because she basically wasn’t interested. She would rather go and play soccer, seriously! In fact, she had requested for this for a few times! I was surprised by her interest! Four hours into role-play and I could totally sense the girl’s exhaustion. She had swimming lesson that morning and didn’t get to nap before going for Kidzania and I know she was going to get cranky soon. In the end, she chose a simple activity which was to shop at a supermarket although she wanted to be a cashier (not old enough). The last activity before she got to spend her hard-earned money – kidZos – at the department store was to go on a tour around Kidzania which she needed to pay for. I guess this was a good ending! I’m glad we made it for this visit to Kidzania though I wasn’t so keen initially. I feel it is too young for a newly-minted 4YO to understand and fully maximise the time spent in Kidzania. I think it would make more sense for the older kids. Besides, there are other roles that have age and height limits. Nonetheless, it was a good experience. I got to observe how Faith behaved through the various roles and got to know her interests. For her, she learnt dental care from being a dentist (for example) and most importantly, she had fun. I don’t forsee us going back soon but perhaps once a year? Many of my friends prefer to go to the ones in KL and Bangkok because of the cost. Maybe we could try that option too! To understand Kidzania (SG) a little more, I find this guide a comprehensive one. Christmas is approaching and if you want to catch the festive mood in rainy Singapore, there is a place you should go – Flower Dome at Gardens by the Bay. It’s beautiful, I tell you! It was the beginning of the year end school holiday and while the men were at work, the wives decided to bring the kids out to experience Christmas cheer. You will get wowed by the display. Simply awesome and magical! Cocooned in a giant glass globe, a lovely ballerina beckons visitors to come forward, as a band of toy soldiers and an angelic choir join in the merry medley. (Source: Gardens by the Bay). To have a decent pic, one must snap quickly or else you risk getting photobombed! The whole troop. Remember to visit ya? One of the perks of being a SAHM is to be able to have brunch with fellow moms during the weekdays and more often than not, you won’t meet with a crowd. Of course, if you can get someone to help mind the baby for just a short period of time, it would really be an awesome ME time activity. A few days ago, I checked out the Stamping Ground Coffee along Upper East Coast Road and was totally mesmerized by the interior. What a relaxing place! I just love everything about the decor! Since it was a weekday, there were only a few customers and I felt totally at ease with Daniel. Soon, my mommy friends arrived and we had a heart-to-heart talk about things that matter to us. It was really serene and I would recommend this place! I had my usual cafe latte and since we met for brunch, we had a go at their food. I must say it’s satisfying! The other side of the cafe houses a beautiful space where floral arrangement and jamming could be conducted – Dawn Q Floral Design. It’s such an inviting space! I must find time to have a floral jamming session, just for the fun of it! Definitely going back for more. Grab a book or something. It’s a place for retreat! Following the previous run, I’m looking forward to yet another one. This time round, I hope to be participating with da man and the kids. Enter Nickelodeon’s first ever SpongeBob Run in Asia which will flag off in Singapore on 6 August 2016 at Siloso Beach Walk, Sentosa. Join SpongeBob SquarePants in search of his missing best friend Patrick Star via this fun run which will see participants cover a five kilometre route showcasing iconic landmarks from the underwater city of Bikini Bottom, including the Krusty Krab, and the houses that SpongeBob, Patrick and Squidward Tentacles live in. I thought this fun run could encourage families to get out and run together, especially in the lead-up to National Day, no? The race course is lined with many trigger-happy opportunities for participants to snap a #wefie with SpongeBob and his friends in life-size cutout boards, such as Sandy Cheeks in her pressurized suit and SpongeBob’s pet sea snail Gary. Fun, isn’t it? :: For BASIC (S$49.50 per pax), participants will receive an official event t-shirt, an event medal and a runner’s license. :: For NORMAL (S$59.50 per pax), in addition to receiving an official event t-shirt, an event medal and a runner’s license, participants will go home with an exclusive SpongeBob Run Singapore plush and drawstring bag. On that day, a carnival filled with nautical-themed activities, food and beverages, awaits SpongeBob fans and their families. At the end of the race, fans can enjoy a screening of three episodes of SpongeBob SquarePants with their loved ones. The first 30 participants who finish the race will get the opportunity to meet SpongeBob and Patrick. Sounds interesting? If you are ready for an evening of fun for your family, do register for the race at the SpongeBob Run Singapore 2016 website. Oh, wait a minute! Before you do that, you could use this promo code SBXLYNN to get $5 off for any of the 2 categories. But do hurry as this promotion is valid only till 4 August 2016. We will be taking part as a family and I need to start training the girl already! Two more months to go! For your information, only strollers are allowed in the event and free admission is granted for children below 0.9m in height provided they are accompanied by an adult taking part in the race (Terms and Conditions applies). However, they would not receive any race entitlements. Disclaimer: We were invited by X-Change Republic on behalf of Nickelodeon and sponsored with a pair of complimentary tickets for SpongeBob Run Singapore. Images and information pertaining to the run are provided by them. No monetary compensation was received and all opinions are as usual, my own. This short video shows a little of the history of Singapore. Brilliantly written, I thought. Link: The Violin （小提琴） from Robot Playground Media on Vimeo. We started our June holiday programme with Masak Masak, the annual Children’s Season at the National Museum of Singapore (NMS) on its opening day. It returns for the second edition from 30 May to 10 August 2015, Last year, we attended with Faith’s playmates and although she was just 18 months at that time, she had fun going through the various stations. So you can imagine how happy I am that Masak Masak is back! This year, the exhibition is made up of 10 installations which features playgrounds of the past and offers a host of activities and engaging exhibits by Singapore artists as well as internationally renowned ones. Allow me to guide you through the various exhibits! And do make sure that you are equipped with this storybook (right) which helps to guide you through Masak Masak as you share some bonding moments with your kids at each installation. Remember these familiar playgrounds that we used to play when we were younger? 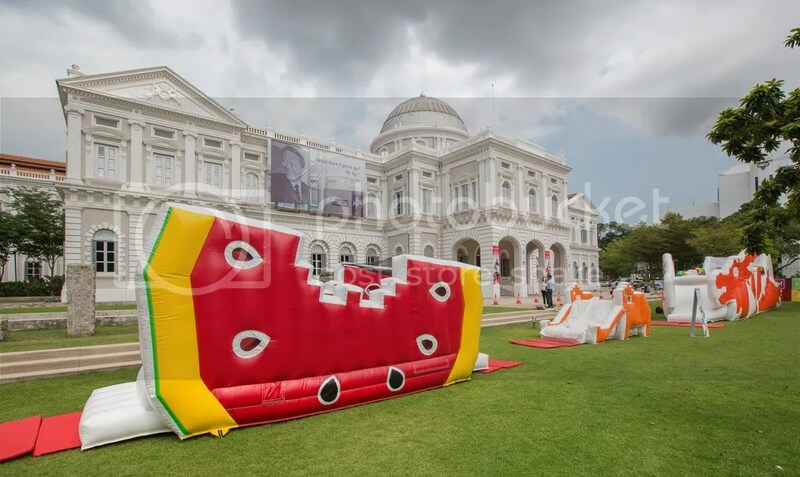 Now they are back in the form of bouncy playgrounds on the lawn of NMS and they pay tribute to the familiar mosaic playgrounds designed by the Housing and Development Board for Singapore’s public housing estates in the 1980s. Do note that they are open for play on Saturday and Sunday from 10am-12pm (very hot) & 4pm-6pm. As you enter the main entrance of the museum, you will be greeted by a rainbow wonderland at the Rotunda. This colourful origami suspension is an installation by Mademoiselle Maurice who draws inspiration from the ancient Japanese legend that promises to grant the wish of anyone who folds a thousand cranes. As you look up, ask your children if they can spot any boats or planes! Mademoiselle Maurice’s Spectrum of Paper continues at The Salon with more intricate origami creations in the form of flowers and animals. It is her response to local artist, Jeanette Aw’s illustration of Sol* holding onto a string tied to a bird in flight. * Sol is a character in Jeanette Aw’s latest illustrated book, Sol’s World: Somebody to Love. This book is available for sale at $19 at the Museum Label shop at Level 1. I thought this is a good time to pay a minimum sum of $2 for some materials to teach the little ones to appreciate the art of paper folding in this inspiring setting. Erm, of course, I think Faith needs a lot of guidance! As you proceed into the Salon, you will see local artist, Jeremy Hiah’s response to Sol exploring nature with his adaptation of a local children’s folktale, Queen of the Forest. The scheduled performance is presented via specially created puppets. Faith has some fun creating her own puppets too with the materials that she purchased earlier. Our little girl definitely enjoyed this part of the exhibit. 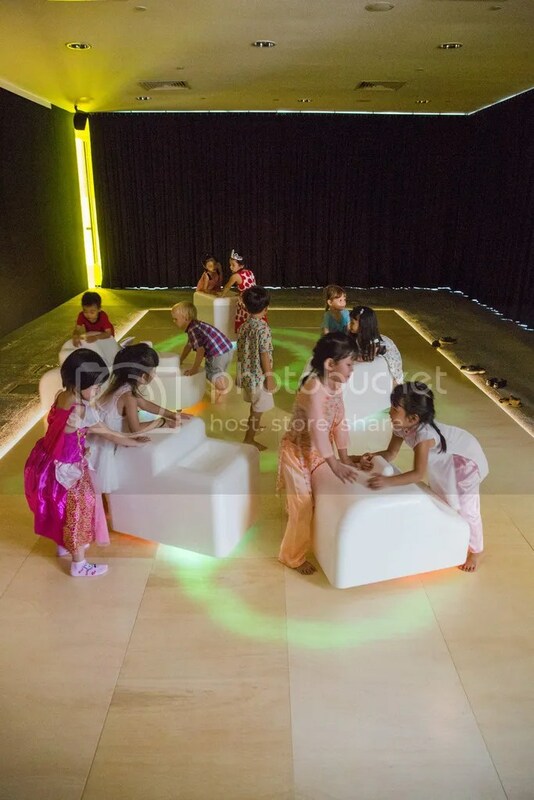 At the concourse, the children can be engaged with a few activities. This Dancing Solar Flowers installation is a good platform to question children about our current use of energy and to think about sustainable energy sources for the future since they use solar energy to move. It’s a bit too abstract for Faith, I think . If you have older kids, this area would be absolutely fun. The giant flower above is inspired by the tin can telephone and challenges us to figure out which cans are connected amid a tangle of coloured strings. And who can forget flag attack? I played this when I was in Primary School and had great fun! So I got Faith to play with me and obviously she didn’t quite get it. Arghh… no fun! :: Garden Games: Can or Not? Faith cannot toss a ring around the coloured bottles. No prize! Navigating a ball out of the maze is highly difficult, even for the Mama! This is Faith’s favourite as she got to enjoy herself in this enchanting forest which is created from simple materials such as crepe paper! Explore this forest with your kids and get down on all fours. This is a good place to play hide-and-seek and imagine the thrill the kids could get as they crawl under overhanging branches and navigate low terrain, burrows and narrow thicket passageways. Erm, we definitely could get more adventurous than this. Ahem! Another exhibit that Faith enjoyed is this group of 11 stations where one could take a walk down memory lane to learn about life in Singapore in the 1950s and 60s through the prints from woodblock printing. The children could get their hands on creating their own prints with the stamps provided. This is definitely a task that Faith could handle! Faith didn’t get to go through this last exhibit because there were too many children inside the Perform @ Play. Also, it was rather dim and the little girl wasn’t too comfortable with it. However, the older kids were having a whale of a time as they got the opportunity to play with the larger-than-life toy vehicles. All they needed to do was to give the toys a little push and they could watch the luminescent trails that appear and gradually fade beneath their feet. Besides these exhibits, there are also some special programmes such as the shadow puppetry workshop which is held on every Saturday in June at 10.30am (note that this workshop requires ticket) and puppetry performance by Singaporean artist, Jeremy Hiah (selected Saturdays). Oh, yes, don’t miss the Momolato at the Front Lawn every Saturday and Sunday from 30 May to 28 June (10am to 6pm). We missed that and it’s such a bummer. I’m sure the special gelato flavour will be a hit with most and do try their award-winning SG50 flavour, Good Old days, as well as other exciting ice cream and popsicle flavours! Disclaimer: Our family was invited to the media preview of Masak Masak 2015 on its opening Day. No monetary compensation was given. One good thing about being a SAHM and one whose kid is not in school is the fact that we could plan impromptu outings and that is exactly what I did for today. SIL gave me some complimentary tickets to Alive Museum and I got Mummy T and Belle to go with us. Since the kiddos are not yet three years of age, they could go in free (which otherwise, they would have to pay $20 per entry). Yay to #funforfreesg. Hah! We were there early because we wanted to avoid the crowd. Besides, the kids are most alert in the morning and have the tendency to respond well to our requests. The crowd came in half an hour later and it was getting difficult to get decent photos of the kids. They must be wondering what was wrong with their mummies that morning since they were whisked from one small area to another and all they were asked to do was to look at the camera. I could tell that Faith was frustrated and disturbed by some of the pictures and soon became a little fussy. There is obviously a need to wait since we needed to take turns to take the pictures. I could only imagine the great crowd and frustration one would feel if he was to go during the weekends. To be perfectly honest, I don’t think this is a great place for toddlers to hang out. Maybe it would be better if they are older and could understand instructions better since they have to pose in a certain manner to have maximum effect. Even if you are so interested to go, I would strongly recommend extra pairs of hands. Mummy T and I had to make sure the toddlers don’t run off while one of us helped to take pictures. Pictures in this set courtesy of Mummy Trisa! I think Alive Museum would be a great place to visit if you are going without young kids (haha). At the very least, you could spend more time going through each art piece and posing in/with it, that is if you are game for it. Our children had more fun and laughter after being issued a balloon each during lunch.